SINGAPORE (April 5): Some Asian currencies edged lower on Wednesday, ahead of a United States-China summit that could highlight trade tensions between the world's two largest economies. The South Korean won fell 0.3%, while the Taiwan dollar and Indian rupee both slipped by around 0.2%. The Thai baht led the losses with a decline of 0.4% and pulled away from a 20-month high of around 34.285 reached on Monday. The baht was weighed down by concerns that the Bank of Thailand (BOT) could introduce further steps to stem hot money inflows, analysts at Maybank said in a research note. Thailand's short-dated bond yields declined at a bond auction on Tuesday, as the central bank cut supply in a bid to slow foreign fund inflows. The BOT will cut its new weekly supply of three-and six-month bonds to 30 billion baht each in April from 40 billion offered weekly last month. Some investors believe the central bank may take more moves to limit the baht's strength, and have reduced their long positions in the currency, traders said. Most other emerging Asian currencies were little changed before talks between US President Donald Trump and Chinese President Xi Jinping that start on Thursday. If the two leaders have an amicable meeting, that may reduce the risk of the United States imposing some form of trade measures against China for the time being and be positive for Asian currencies, said Kota Hirayama, senior economist for SMBC Nikko Securities in Tokyo. 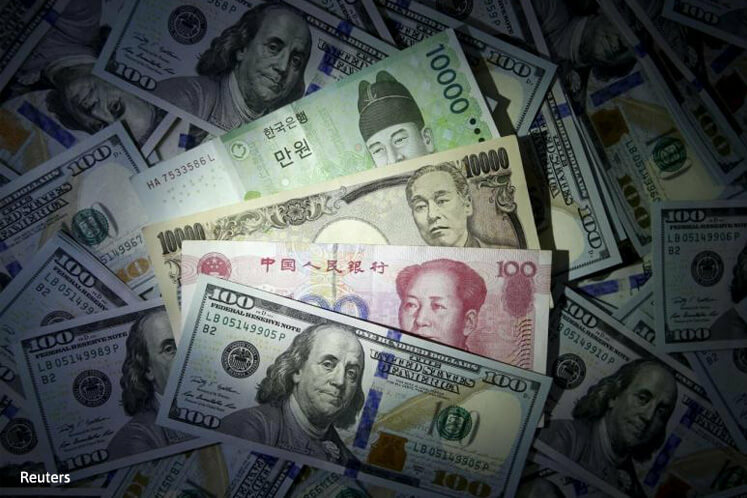 Despite uncertainty about the U.S-China relationship and other risks such as France's presidential elections on April 23 and May 7, Asian currencies will probably stay firm this month, Hirayama said. "I don't think that the broad trend of an improvement (in Asian economies) on the back of a pick-up in trade will break down," he said. The rupiah held steady at 13,323 per US dollar. Since February, the rupiah has mostly traded around 13,300-13,400, with its advance stalling near the 13,300 level per US dollar even though foreign fund inflows into Indonesian bonds have been strong. In March, overseas investors increased their holdings of Indonesian government bonds by 31.3 trillion rupiah (US$2.35 billion). Indonesian authorities are probably reluctant to see the rupiah appreciate beyond the 13,300 level, said Teppei Ino, an analyst for Bank of Tokyo-Mitsubishi UFJ in Singapore, noting that Indonesia's foreign reserves have risen in recent months. "If you just look at the flow of money (into Indonesian bonds), it wouldn't have been strange to see levels such as 13,200 or 13,100," he said.